Richardson Electronics supplies linear accelerator parts such as, magnetrons and electron guns. We are the exclusive distributor New Japan Radio Company (NJRC) magnetrons used in linear accelerators. Linear accelerators are used in medical, industrial, and scientific markets. Please see definitions below for details on the specific applications above. As the exclusive distributor for New Japan Radio Company (NJRC) in North America and Europe we supply high power C, S, and X Band magnetrons ranging from peak output powers of 500kW to 3.1MW for linear accelerators. NJRC’s patented cathode technology along with its improvements in thermal conductivity allow NJRC’s cathodes to run cooler thus increasing lifetime and allowing the magnetrons to operate under more severe conditions. 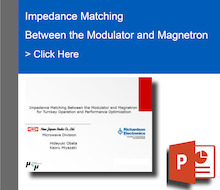 NJRC provides drop-in equivalents, and has the ability to adjust designs on S, C, and X Band magnetrons used in linear accelerators so that its impedance and operating point can match any pulse forming network or solid state modulator. NJRC can also manufacture custom linac electron guns and linac power grid devices with or without grids. In addition, we supply a permanent or electromagnet and transition for S-Band linac magnetrons. Richardson Electronics also offers high quality Eimac power grid devices which are also used in several different linear accelerator applications such as cyclotron accelerators used in both Scientific and Medical markets. Polymerization - an industrial procedure that uses x-ray beams from linear accelerators to initiate a chemical reaction that forms polymer chains. Sewage Sterilization -an industrial procedure that uses x-ray beams from linear accelerators to purify waste water from sewage treatment plants by rendering toxic chemicals into non-harmful products and destroying harmful bacteria and other microorganisms. Cargo Scanning - a process in which x-ray beams from linear accelerators are used as non-destructive method of inspecting and identifying goods in transportation systems. Medical Supply Sterilization - a process that uses x-ray beams from linear accelerators to destroy and/or remove any toxic chemicals and harmful microorganisms.